After spending thousands of hours helping people learn and master movements in the weight room, Bradbury (a gym coach and lifelong golfer) began to look at putting differently. Very differently. Being tired of following “traditions” and having poor results on the green he began to think outside-the-box and used his extensive knowledge of how humans see, react, and learn to perform a task. Unlike most sports, golf is a game played to the side of the ball. This robs you from having your eyes set in their instinctual, binocular setting. As you will learn, this creates a very strong optical illusion, especially on the green near the hole. This confuses the heck out of your brain. In Predator Putting, Bradbury does a terrific job employing the K.I.S.S. method for putting. His productive practices last minutes, not hours. He gives you a routine to follow during your scoring rounds that takes the guesswork out of putting. Difficulty with short putts will be a thing of the past. This book will work wonders for the golfers who do not have much time to practice, but want to dominate their weekly foursome. You have to SEE it to BELIEVE it! 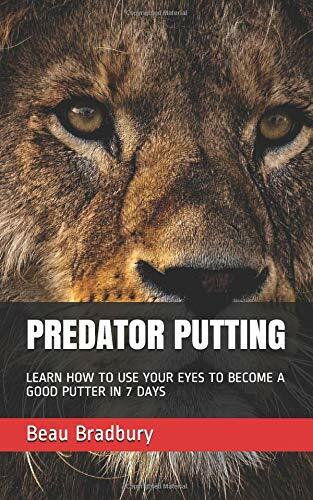 Since putting makes up 40% or more of the game, Predator Putting will be your secret weapon for lower scores.